The Labour politician today said that he would support a second referendum on the Brexit vote as a last resort to prevent Britain crashing out of the EU without an agreement. He said despite risks a second say on whether Britain should leave the EU could result in social unrest as well as deepening divisions in British society, he would still push for it. 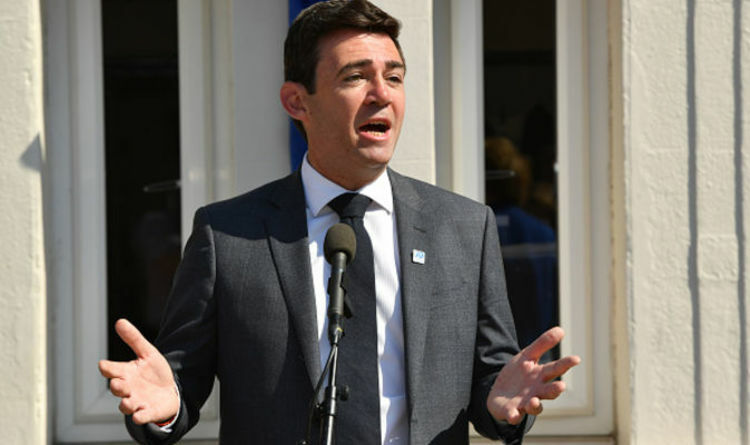 Mr Burnham also added that it was “alt-right” activists that were pushing for a no deal agenda in order exploit a divide between Britons that wanted a hard Brexit and a soft one. He risked further infuriating Brexiteers by arguing that if Britain was heading towards a no-deal Brexit it should be up to Brussels to cancel the March 2019 deadline to allow time for further negotiations. Should a deal fail, Brexit should be cancelled, Mr Burnham said. He said: “I have to think seriously about what a second vote would mean on the streets of Greater Manchester. “If we thought the first was bad, the second would be a whole lot worse. Eurosceptic Mr Burnham also said right-wingers were driving their own agenda in order to “set up a clash in our communities from which they think they can profit”. Despite his comments, Mr Burnham said he did not support the People’s Vote campaign which also called for a second Brexit referendum, but said that he did support a second ballot only in the event of a no-deal Brexit. Mr Burnham acknowledged that a second vote “would cause real division on our streets, but there is only one thing worse than that and that is crashing out of the EU without a deal”. Mr Burnham also said the June 2016 referendum was as much an “instruction for Westminster to review its relationship with the rest of England” as a message to the bloc. Today, Brexit Secretary Dominic Raab faced more pressure to secure a deal after being ridiculed by former Bank of England governor Mervyn King, who condemned the Government’s “incompetence” in securing an agreement with the EU. Lord King said it “beggars belief” Theresa May’s cabinet are talking about stockpiling food and medicines when Britain is the sixth-biggest economy in the world.